In most disciplines a stop will be on the exam. Styles may vary slightly but in every pattern or test the stop is your presentation’s final “ta-da”. What is the judge looking for?. Location. Your horse should be able to stop in the exact imaginary box of your choosing, not in a general, geographic region. In equitation, dressage and horsemanship patterns for example, missing your marker is a hefty error. Softness. A gapping mouth, a poked out nose. Both are symptomatic of a horse giving his rider “push back”. Straight. Your horse should stop with all his train cars in line – nose, shoulder and hip. Any part that pops out of alignment will result in a poor, unbalanced stop. Energy. With each stride approaching the marker, the horse maintains a lively rhythm. It’s natural to lose steam on approach. Each stride gets flatter, even breaking gait – a major fault on the scorecard. Imperceptible aids. In the prettiest stops, the rider maintains classic equitation. No hauling on the reins, leaning back or stepping on the dashboard. Preparation. The key to a good stop is preparation. As you approach the stopping point, align his body parts arrow straight. Make a connection to your horse. A rebalancing or call to attention. Ask him to soften into bungee cord rein contact as you maintain the stride rhythm with your leg. Pre-signal Now sink into your seat bones to anchor yourself deeper in the saddle and stop following the stride motion with your hips. Your horse will begin to recognize this subtle change as the pre-signal. Signal. Say “whoa”, while your seat remains deep and immobile. This is your cue to stop. Horses recognize the tone and volume of voice commands – not the actual word, so theoretically it could be any random word. Just make sure the cue sounds the same every time you say it. Save it only for stopping…and mean it. Note: in some disciplines ie dressage, voice commands are discouraged. In most, discreet use of voice is acceptable. In either case, a vocal cue is a useful training bridge which can be eliminated eventually. Correction. 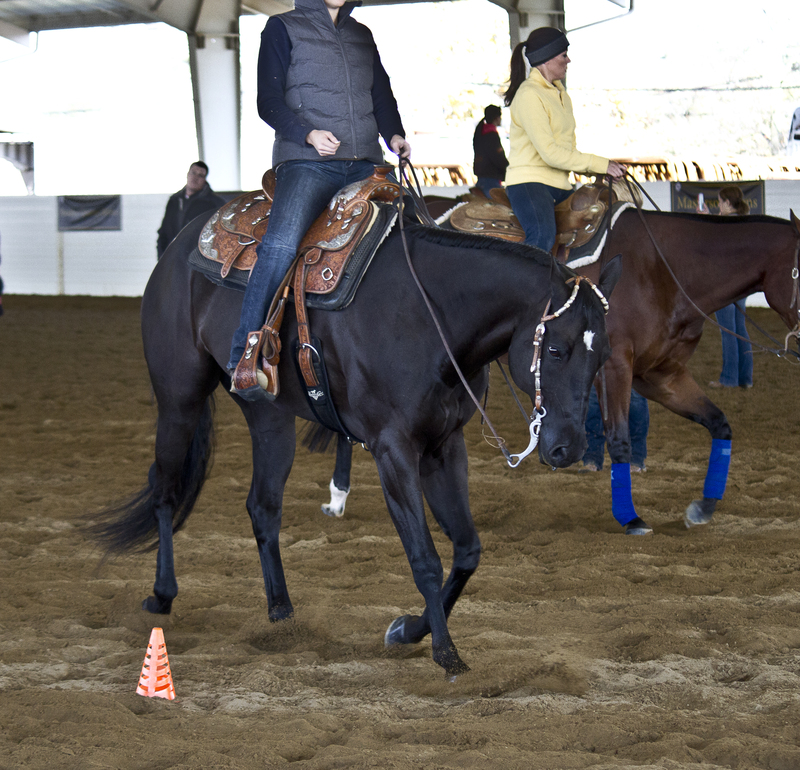 If he doesn’t halt on the next stride, follow immediately by reining back several steps. No drama. This isn’t a punishment. After several repetitions you can expect your horse set himself up to stop when he hears your signal. He’ll tune his ear back and shift his weight onto his hindquarters. This is where anticipation becomes our friend! Thereafter, only back him when he’s getting casual about responding to your “whoa”. Like jumping, or loping trail poles, I count down strides with my students as they approach the stopping point so that they halt out of a rhythmic gait. Preparation– several strides away from the marker. Then soften your body and flow for the next couple of strides. Pre-signal – two strides away. Stop – at the marker. Do keep the process simple for the horse. When leg and rein are used simultaneously, it’s conflicting to a horse. Each aid should be used distinctly and in sequence.